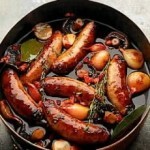 If you have never tried our venison sausages, this recipe is a good way to start. They are acknowledged as some of the best and this is a marvellous way of cooking them. Take a heavy casserole and brown the sausages all over in a little olive oil. Remove the sausages from the pan and fry your bacon, garlic and mushrooms, sprinkled with parsley. For the sauce, put the shallots and red wine in a saucepan and reduce over a low heat until there is only about two to three inches remaining. Add the juniper berries, stock and the Crème Fraîche and reduce again for a further 7 or 8 minutes. Add the partly cooked sausages, the bacon, garlic and mushrooms and cook for 20 minutes. Just before serving, strain the sauce through a sieve, allowing the liquid to run into a heavy saucepan, placing the sausages and other things back in the original pan. Place the sauce back on a low heat. Cut the butter into knobs and add, whisking as you go with a hand whisk. The resulting sauce will be a pretty plum colour and taste divine! Pour back over the sausages, sprinkle with chopped parsley and a little thyme and serve with creamy mashed potato and crusty bread to wipe up any extra sauce!